City officials are pressing state lawmakers to add dozens more liquor licenses in Boston that would be designated for specific neighborhoods, in a move those officials say would close gaps in the law and boost struggling communities like Mattapan. The current law sought to spread the licenses among seven neighborhoods, including some of the city’s less affluent communities. But reform advocates contend it has not worked as expected, instead creating uneven competition among neighborhood businesses. Savvy and well-established owners — such as the Hilton Garden Inn in East Boston — snatched up the licenses, while neighborhoods like Mattapan foundered, with no applicant stepping forth. The new plan would reserve licenses specifically for certain neighborhoods until they had a restaurant that is ready to apply for one. “We are working to craft legislation that does not inadvertently pit neighborhood against neighborhood,’’ said City Councilor Ayanna Pressley, who is expected to raise the new effort with her colleagues. Expanding liquor licenses has been a huge political issue over the past several years that has left lawmakers, including Mayor Martin J. Walsh, wrangling over how best to drive the economies in certain neighborhoods. Unlike neighboring Roslindale, Mattapan does not have a restaurant that serves alcohol. 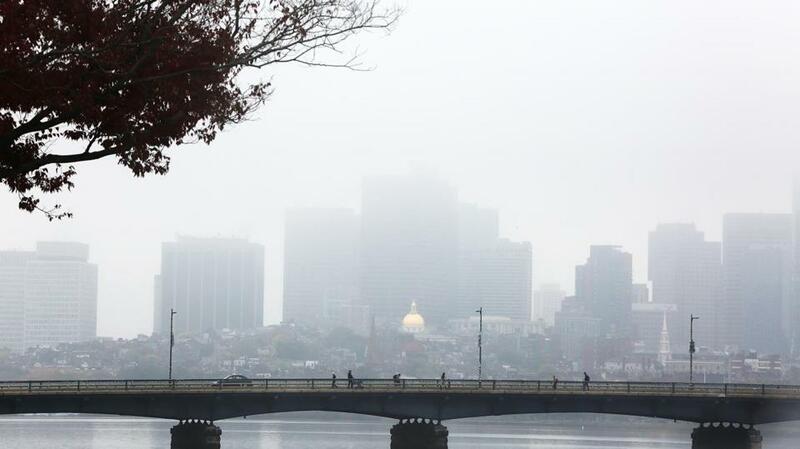 Residents have long urged for one, arguing that a thriving restaurant scene in any neighborhood would drive out trouble, bring more families out at night, and revive the economies of communities that exist in the shadows of downtown and the Back Bay. 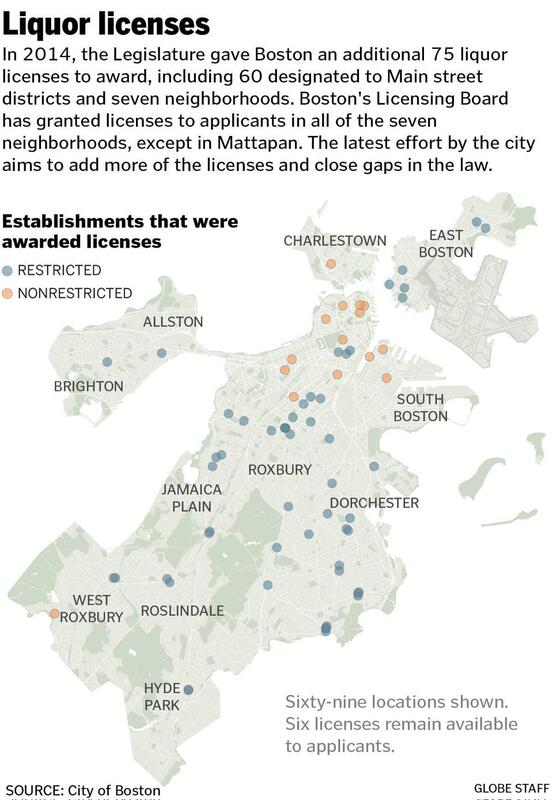 The current law, passed in 2014, gave Boston the authority to award an additional 75 liquor licenses in seven neighborhoods — Dorchester, East Boston, Hyde Park, Jamaica Plain, Mattapan, Mission Hill, and Roxbury — that traditionally had not had many of the licenses. The business districts in other communities such as Roslindale and Brighton also qualified. Sixty of the licenses were restricted to those communities, and 15 were available to applicants citywide. The law also made liquor licenses more attainable and affordable at just under $3,000. Anyone with a lease could apply for one. But as the licenses were being awarded, a troubling, unintended pattern emerged: Business owners in well-established centers in East Boston and Dorchester were lined up and ready to obtain a license, officials said. Charlestown, seeking to revive its restaurant scene, was not included in the process and did not get one. Mattapan has not had a single applicant. Boston currently has a total of 1,148 liquor licenses. The legislation in the works would avoid that issue by dedicating a specific number of licenses for a place like Mattapan, which can set its own timetable and apply for a license when it is ready, Barros said. “In the new legislation, we have a dedicated 15 licenses to Mattapan — only for Mattapan,’’ Barros said. Mattapan, a neighborhood with lush backyards and tree-lined streets, has struggled to turn an economic corner. It has been hampered by a feeling of isolation from the rest of city, a lagging reputation, and a lack of interest from restaurateurs willing to set roots there. State Representative Russell Holmes said it has been tough trying to find businesses to take a fresh look at Mattapan, which has seen millions of dollars in government investment in a restored greenway, beautification of its parks, and the revival of its main square. Plans are also underway to turn an old state lot into a massive development, which advocates are eyeing as the site for a sit-down restaurant, Holmes said. The legislation being hashed out would allow the neighborhood to continue to grow and sell Mattapan as a place for new business, he said. “We need businesses to step up and recognize the jewel that Mattapan is,’’ Holmes added. Charlestown has had an incredible turnaround, with more urban professionals occupying high-end condominiums and a Whole Foods Market in its midst. The neighborhood is also eyeing the new licenses to jolt its dining offerings, said state Representative Daniel Ryan, who supports the reforms. “This is a real opportunity to bring in some new licenses that are restaurant oriented in the neighborhood,’’ Ryan said. Officials working on the new measure are trying to address the unintended problems that arose during the last process, said state Representative Michael J. Moran of Brighton. In correcting gaps in law, the officials said they are hoping to give other communities another economic lifeline, said state Representative Aaron Michlewitz. He said residents in his district, which includes Beacon Hill, the South End, and the North End, aren’t keen about adding new liquor licenses. But Michlewitz added that he supports licenses in communities like Roxbury and Mattapan. Moran said the mayor revived the talks about expanding the law during a casual conversation at Christmas. Walsh — with members of his staff and city councilors in tow — also made a pitch to legislators from Boston at the State House last month. The mayor’s team discussed the possibility of doubling the number of the licenses from 75 to 150 and making the licenses restaurant-based. Walsh also included the liquor license program as part of his administration’s 2017 legislative package, signaling the issue is a priority. City officials cautioned that the discussions are in early planning stages and that the number of new licenses could change. The revived effort was previously reported in the Charlestown Patriot-Bridge. A proposed bill is expected soon.